So amazing to witness the moment when he learns/unlearns, and how it seems to just click in place, somehow. Absolutely mind boggling how he actually had to unlearn something which he’s known for decades in order to learn the new way to ride a bike. It took him much longer than I thought it would, at that, and comparing that to the experience of his son…. Wow! And yeah, I am deliberately vague, and hope you get curious enough to actually press play on the video above. This really is something worth spending a few minutes on! Ok? Possibly you’ve already read the story about Daniel Norris, the baseball pitcher in the US, who definitely stands out in a crowd? I read the article some weeks ago and got very inspired by what I read. I wanted to write about it, but only got around to it now. And since it’s been a while since I read it, I just re-read it, and listened to the clip as well. It’s all there in the article. Read it. Listen to Daniel. When I come across a person, who – like Daniel – lives according to his values, rather than according to his circumstances, I get filled with hope. Hope for the future. For humanity. Here we have one man standing out. Refusing to conform. To the norm. To do what, according to the masses, probably should be the proper action to take after signing a multi-million dollar contract. To do what he himself thinks makes sense. Being able to hear the inner voice of wisdom, act upon it, rather than having it drown in the constant barrage of noice from outside. That voice which can sometimes whisper so silently one really has to listen very very carefully. Get knowledge. Be kind and loving. Be happy with what you’ve got. Yeah, why couldn’t it be that simple? It’s truly inspirational! How do we ensure we get more people into the world with this ability? To listen within? To stand for ones convictions, in the face of rags and riches alike? Do I? 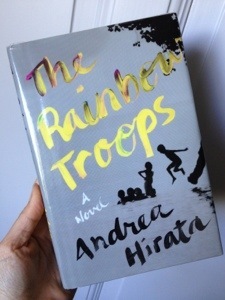 My brother suggested I read The Rainbow Troops by Andrea Hirata. So I suggested the book for the library to purchase, and lo and behold, it worked this time around as well. I got a note saying the book was ready for me to pick up, and I did. The story is about a group of children going to a dirt poor free school on the island of Belitong in Indonesia. It’s a fascinating story, told with beautiful language. Schools as a means to provide individuals with knowledge which leads to self-value, celebrating humanity with dignity, joy of learning and the light of civilization. Schools as a means to materialism, to making money, getting rich, gaining power and fame. Those are two ways to answer the question of ”Why school?” – my question to you is: What’s your answer?